This premium replacement seat is sewn with UV and abrasion-resistant polyester thread and boasts 30-oz. marine-grade vinyl to stand up to all the elements. It is constructed with a water resistant molded foam base, an integrated lumbar support for prolonged comfort, and a heavy-duty design featuring high-impact polypropylene. 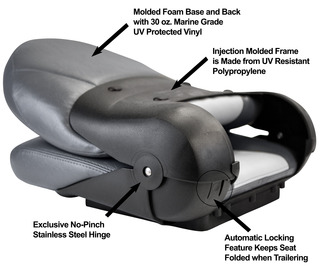 This seat has been a preferred choice with top U.S. boat builders for years and features a patented no-pinch hinge with an automatic fold-down locking tab for trailering and running. A universal seat bolt pattern is molded into the frame to accept any 5-1/4” mounting system or pedestal. Stainless steel mounting hardware with Loctite patch is included. Ideal replacement for helm seats, pedestal-fishing seats, ice shelters, duck blinds—even mobility scooters. Made in USA. 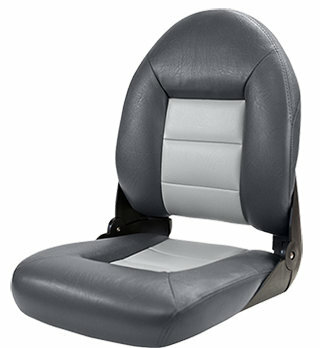 Q: Can I buy replacement cushions for the NaviStyle™ seats? No, the NaviStyle cushions are not sold as replacements. Q: Can I use the Quick Disconnect Kit with this seat? No, the Quick Disconnect Kit is only compatible with the All-Weather and Profile Guide Series seats. Q: What is the bolt hole pattern for the mount? The bolt hole pattern under the seat for the mount is a universal 5 ¼” square. Q: Can l use the TEMPRESS Quick Disconnect Kit with this seat? No, the Quick Disconnect Kit is not compatible with the ProBax Series seats. Q: Is this a folding seat? 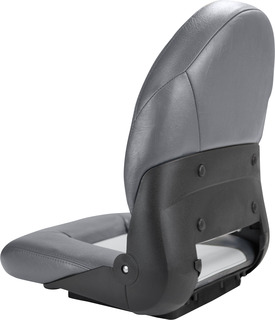 Yes, this is a folding seat that has a built in locking mechanism to keep the seat in the down position when trailering or running from spot to spot on the lake. Q: My current seat has a part number of T4500 on the bottom of the hard plastic seat shell, is T4500 this seat?